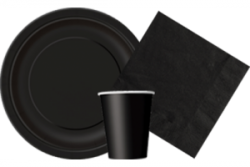 Midnight Black Compact Plastic Tablecovers 54" X 108"
Midnight Black Round Plastic Tablecovers 84" . Midnight Black Plastic Tablecovers 54" X 108"
Black Polka Dots Gift Wrap Roll 30"× 50" Ft.
Black Polka Dots Paper Chain 5 Ft.
Cheap Party Shop is trading name of Satya Overseas Consultants Ltd. Registered in England & Wales Number is 07431966. Vat number is 186370583.